Hello again! And thank you for your patience while I was doing magical things with the limited space in my house. It's still not done, but the worst is over, and at the end of last week I was finally able to get to the yarn (aka the good part.) And not a moment too soon! Because as you can see from the bits of leafy matter in the photo above, fall is coming. Actually I'm kind of amazed at what I was able to accomplish over the the last three weeks, merely by giving up writing a new Hugs post every day (okay, and sleeping and also healthy eating.) So amazed, I'm going to take a few minutes to tell you about it - because it's nearly fall, and everybody talks about organizing in the fall - even Lands' End! 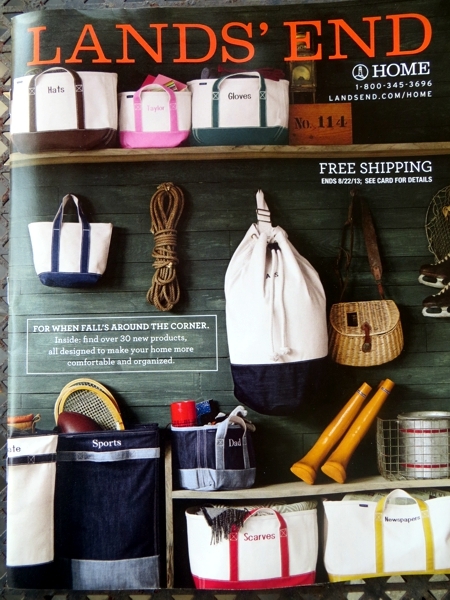 I love the idea of these monogrammed totes, don't you? Not to mention the look of the storage wall they are lined up against. Totes aside though, cooler weather coming means it's a good time to clear away the stuff you're not going to knit so you can get at the stuff you will. a/ do I need to keep this? b/ if so, what does it need to be kept with? c/ and what is the best place to keep it in? As you can imagine, question a/ is the one that causes the most heartache. A lot of what we keep is through carelessness and can be recycled or thrown out. Or it's simply kept in the wrong place because we didn't have time to think of the right place, or didn't realize we would have enough like it to justify creating the right place. But some of what we keep is just emotional. Maybe it was given us by someone we love who's gone now, for whatever reason. Maybe it was acquired at a very special time in our lives. Maybe we invested quite a bit in acquiring it, either financially or through our own physical efforts, as with medals from marathons. It's the emotional things that cause the trouble, I find. It's much easier to shift a lot of shelves so that all the photo albums can be in one area and not intermingled with sports equipment, than to decide whether it's time now to part with something that serves only to jog a memory. And surprisingly, all of that emotional undercurrent applies to knitting, sewing, and other craft supplies. 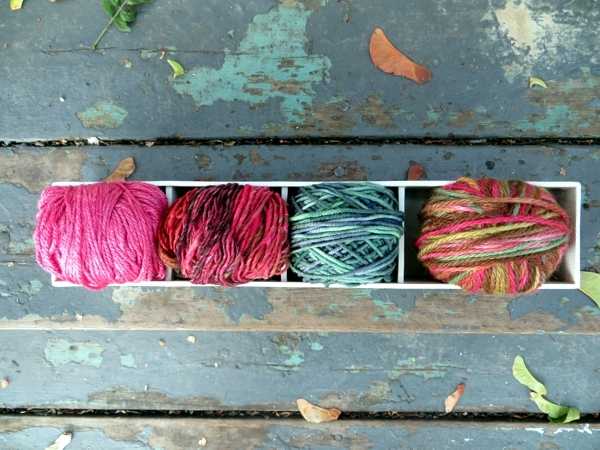 You've probably noticed it yourself, when you bought yarn just because you loved it, and even though you didn't know what you might make with it. Or because you were on holiday and wanted a non-breakable souvenir. Or because you were shopping with the kind of friend who is a truly horrible enabler, like me for example, and overspent. As Trish once pointed out regarding the hazards presented by our five local French or Belgian bakeries, a treat is a treat, but when you have a treat every day, it's become a staple - and that's when things get problematic. 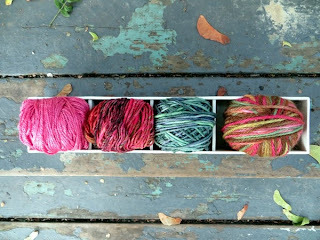 Well, for me, new skeins of yarn have been a staple for a good long time. Another pitfall I've fallen into - maybe you have, too - is that the less my life resembles that of somebody with the free time and space to pursue creative inspiration, the more I devote myself to creative tasks. It's like I think I can convince myself I am a lady of leisure if I just sew fast enough. Either way: I've accumulated a lot of craft material over the past four years, and I needed to get rid of some of it. The three questions I mentioned above don't exactly apply to textiles and tools, have you noticed? I mean - "do I need to keep this?" It's yarn; of course you need to keep this. And you need to keep it with other yarn, anyplace in the house where you might want to look at yarn, which is everywhere. a/ Do I love this? Or do I just feel like I should? b/ For what kind of purpose am I most likely to reach for it? Because it should go with other things that match that purpose. c/ How much space do I need to allocate for this category of gear? Because from now on, I'm keeping like with like, not spreading it out across several hiding places so I don't know what I have and accidentally buy more of it. 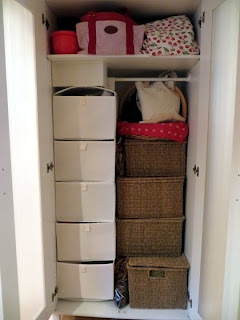 I did this so the remaining craft supplies - not counting fabric, which lives near my sewing machine in another room because it's the only place there is space for it - would not actually fall out of the main craft storage space. 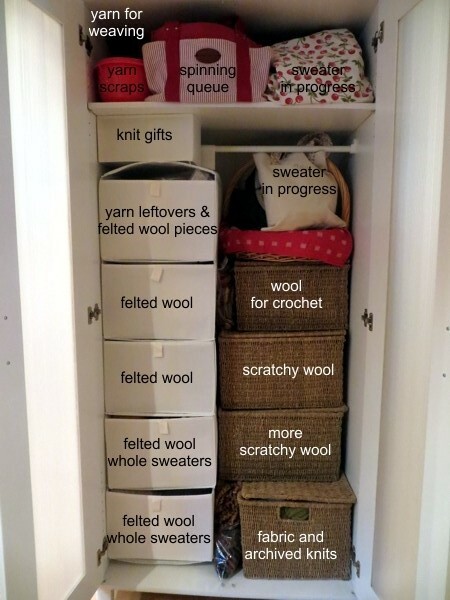 This consists of one narrow IKEA cabinet serving as primary storage for the yarns and fibers I'm digging into daily, and a wider matching one serving as secondary storage for the things I only think I might need soonish. 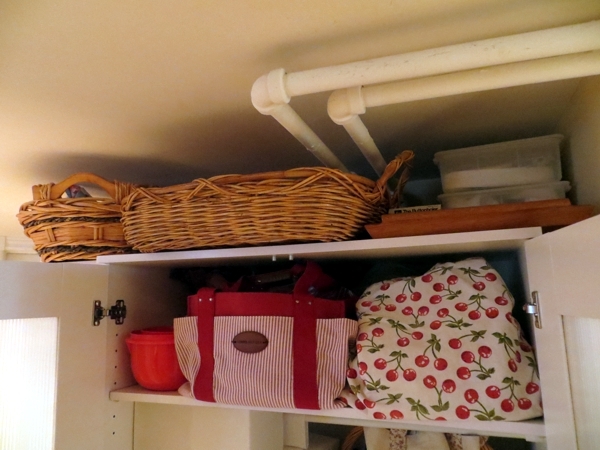 Oh, and also the top of these two cabinets, upon which rest baskets that had become crammed full of handspun wool and towels for drying knitted things I'd just hand washed. Okay, it's not going to make the cover of a magazine - but isn't it neat and tidy? And this in spite of my realizing once I was looking at all that crazy amount of fiber and yarn and fabric that I really, really love working with felted wool and didn't want to get rid of any of it. I did dispose of some, because I knew there wasn't space for it all, but I kept the best. As you can see, I separated out the yarns by what I wanted to weave with, and what I reach for only in particular situations. Evidently I need to spend some time looking for knit and crochet patterns that make the most of scratchy wool yarn, since I seem to have kept rather a lot, ahem. I've started soaking my handknits in the washer in lingerie bags, then spinning them dry, so I don't need to keep all those towels here any more. And there's space in the primary storage cupboard now for my handspun yarn, so the basket that used to hold them now holds empty project bags, ready to accommodate the next yummy pair of socks or hat. Probably in about a week I'll suddenly realize I have a use for something I sent away, but when that happens I'll take myself right over to one of these two cupboards and distract myself with something else. I expect there's about two years' worth of knitting in here, minimum, if I don't buy anything new - and that means it'll be a long time before I'll have to regret cleaning up. And that's me for today. I promise I won't be so long-winded next time! And also, that I'll have pictures of actual knitting. Take care of yourself and I'll see you tomorrow.